Social media technology is an innovative way for businesses to collaborate, network, and provide a mechanism for individuals to interact. When social media technology is used effectively, it can be a powerful tool for businesses to market themselves and obtain important data on their customers and competitors. Given the importance and public nature of today's consumer opinions, it is vital for companies to present themselves effectively on social media. Some companies and their employees are not familiar with this form of technology and do not realize the massive amount of data social media sites can generate. Therefore, companies need to develop a social media policy and educate their employees on how to analyze and respond to the data produced from social media. 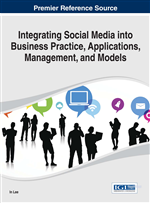 This chapter studies Web 2.0 tools and social media in today's business world and provides guidelines of adopting social media for organizations. Social media and Web 2.0 tools have the potential to greatly affect many facets of an organization. From upper management decision-making down to the delivery of the service or product, Web 2.0 applications and social media have the ability to greatly affect organizational structure. Furthermore, customers have the ability to interact with multiple functional units of the organization and its members in real time. Companies want to find a way to differentiate themselves and connect with customers. Through social media and Web 2.0 tools, businesses can deliver a better, more specific product tailored to the needs of their customers (Armstrong & Gao, 2010; Blanchard, 2011; Mayfield, 2008; Pentina, Prybutok, & Zhang, 2008). Social media and Web 2.0 tools can assist an organization to achieve sales goals through expanded marketing and expanding their brand presence to potential customers. Web 2.0 and social media applications allow businesses to achieve organizational objectives through a higher level of information sharing (Bateman, Valentine, & Rittenburg, 2013; Harridge-March & Quinton, 2009; Subramani & Rajagopalan, 2003). Companies seeking to expand their presence can turn to Web 2.0 and social media applications. These tools allow customers to easily interact with companies from devise running on multiple platforms. Social media technology provides today’s consumers with an easy way to voice their opinions and experiences, positive or negative, online for the entire world to see. Other consumers can reply and react to these posts leaving businesses with an enhanced or tarnished image (McAfee, 2009; Pentina, et al., 2008; Taylor, Lewin, & Strutton, 2011). Businesses are becoming more competitive and efficient within their markets. Businesses need to ensure that company policies are prepared to handle the security and privacy concerns that could arise from the use of these technologies. Organizations must work to overcome potential issues when they open themselves up to Web 2.0 and social media tools. Businesses integrating Web 2.0 applications within their organization need to be prepared to properly train employees to ensure that these technologies are best utilized within their organization. If implemented correctly, Web 2.0 and social media can improve collaboration among employees. Furthermore, Web 2.0 and social media have helped to facilitate a new way consumers interact with brands, and the way that businesses respond to these interactions (Bhattacharjee, Gopal, & Sanders, 2003; Mayfield, 2008; Harridge-March & Quinton, 2009). Software packages and applications are available to manage data associated with social media. Companies can use these solutions to help them not only collect the data but respond to consumer concerns and issues so consumers know their opinions are being heard and taken seriously. Gone are the days of a company being solely in charge of its reputation and image. A company’s choice is not whether they are participating in social media it is what role they will play in it.